Access Our Exclusive FDA Calendar and Subscriber Only Content! 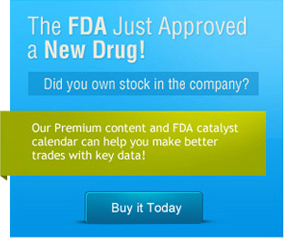 FDA Decisions Calendar and Subscriber Only Alerts! Why? Because They Know When Explosive Stock Moves Are Coming In Advance! Our Exclusive FDA Calendar includes a database with hundreds of entries and was originally created to track companies with pending new drug, biological agent, or medical device new product decisions at the FDA. With the launch of BioMedReports.com, the FDA Calendar was expanded to include the categories outlined below. Click here for an overview article and tutorial on how to best utilize the FDA Calendar database for investing, trading, and monitoring new medical product innovation. Pending mid and early-stage clinical trial results, with a focus on emerging small / micro-cap companies. The FDA Calendar includes the company name, ticker symbol, decision date, and the lastest updated description and notes. Each entry includes a summary of the pending regulatory or clinical trial catalyst event and other relevant information such as FDA Advisory Panel Meetings or previous decisions, if applicable. Pending FDA decisions and late-stage clinical trial results have the potential for major stock price implications in many cases, which are amplified as the size of the company becomes smaller. Our subscriber only article series often feature small cap companies which have pending news, regulatory or clinical trial catalysts. Premium subscribers get that information much sooner than our regular readership. Our Subscriber Only Alerts and Articles give biotech investors the edge they need to make their investments and trades more successful. Learn information about up-and-coming companies and catalyst events. Discover overlooked and undervalued pharmaceutical and health-care investment opportunities long before others. Some of our recent Subscriber Only Alerts have moved stocks an average of 10-20% before being made available to the rest of the market. Why? Because our reporters focus all of their attention on this sector of the market and they chase the stories others only guess about. Through research, investigation and interviews with company insiders, their combined knowledge of biotechnology and market analysis comes through time and time again. Let us help you decipher the news and point out the investing and trade ideas that most others miss. The companies covered on BioMedReports do not compensate us in any way shape or form. Our readers know that they're getting solid, no-nonsense information when it appears on our news portal. Strict regulations prevent us from spreading false information, so we always double check our sources and do our best to present the best possible data. There is no question that knowing when these FDA and catalyst events are coming will help you make better investing decisions and exponentially increase your chances of making money with better trades! Make money with our unique sortable database tool which is used by retail and institutional investors alike. Buy the right stocks- ahead of time- before the crowds arrive and volume takes the price per share much higher! Its a simple and very effective way to invest and trade. Trading without the latest updated information and inside data will cost you much, much more than our modestly priced subscription. Don't trade biotech stocks without this great research tool! The monthly average cost for this critical information starts as low as $20. That's the same as an average online stock trading commission! Some intitutional investors and hedge-fund managers pay over $30,000 per year for this kind of information! There Is No Need To Buy Any Of Those Other Expensive Research Reports! to hundreds of pending FDA decisions, clinical trial results, and pending re-submissions or new filings for FDA approval. The terms of service for BioMedReports.com include a non-refundable payment of $199.99 for discounted, yearly premium access to the FDA Catalyst Calendar and special reports. Users understand and agree that the dates appearing in the FDA Calendar are obtained through reliable, public sources such as company press releases, SEC filings, government notices, and other published resources but are not endorsed or affiliated with the Food and Drug Administration or any of the companies whose names appear in the calendar. The authors of this site shall not be held liable for any trading losses which occur as a result of the estimated decision dates or other information included in the FDA Calendar or elsewhere on this website. All of the dates included in the FDA Calendar and other opinions appearing on this website should be used for informational purposes only and should not be construed as specific trading or investing advice. © 2010 BioMedReports.com. This website contains information and opinions based on data obtained from reliable sources, which is current as of the publication date, and does not constitute a recommendation that any of the securities mentioned herein are appropriate for any specific individual circumstances and does not guarantee that future results or performance will match those predicted to occur. Although every effort is made to ensure the accuracy and completeness of the information on this website by using reliable data sources such as SEC filings and press releases, no guarantees are made in this regard as it has not been reviewed or certified by an independent auditor. The contributors on this website are not chartered financial analysts and we do not provide individual investment advice. Our site uses PayPal for a safe and secure method of check-out payment processing, but users are not required to have a PayPal account and are free to use their existing credit or debit bank card to fund purchases at no extra cost.